In stock -This product will ship today if ordered within the next 10 hours and 30 minutes. 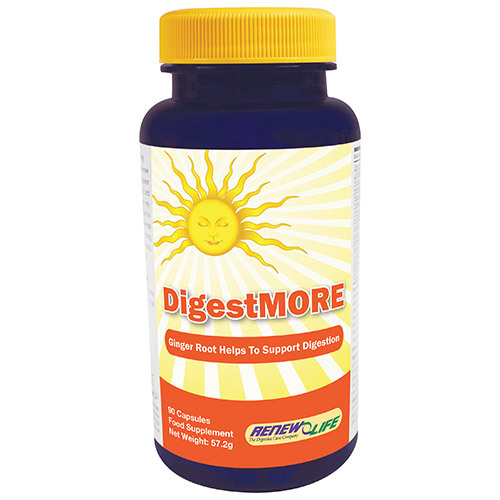 DigestMORE is a plant based digestive enzyme formula designed for digestive problems which do not occur everyday or only occur with a specific type of food or quantity of food. Pectinase Enzyme*, Ginger Root, Rhizome (Zingiber officinalis), Vegetable Capsule Shell (Hydroxypropyl methylcellulose, water), L- Glutamine, Amylase Enzyme*, Marshmallow Root (Althaea officinalis), Papaya Fruit (Carica papaya), Protease Enzyme*, Malt Diastase Enzyme*, Lactase Enzyme*, Lipase Enzyme*, Bromelain Enzyme*, Gamma Oryzanol, NAG (N-Acetyl-D-Glucosamine), Cellulase Enzyme*, Phytase Enzyme*, Invertase Enzyme*. 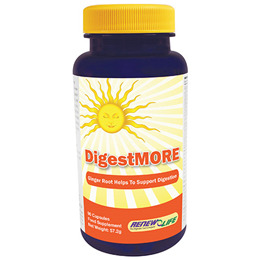 Below are reviews of Renew Life DigestMORE - 90 Capsules by bodykind customers. If you have tried this product we'd love to hear what you think so please leave a review. Best enzyme used to date, and I have tried a few!